It’s no secret that Google is constantly changing. While products like Google My Business (GMB) are rarely completely overhauled, they do get frequent updates that change the way we should be creating and optimizing a Google My Business listing. This includes image sizes within the GMB listing and in GMB posts. When looking to claim, create, update or optimize a GMB listing, it’s important to follow Google’s guidelines. Failing to pay attention to things like type of images allowed could result in GMB images being taken down, or getting buried by other content – a definite no-no in the online world! Beyond putting a local business’ best foot forward with images, if you don’t upload the images to a Google My Business listing, photo mishaps can occur. 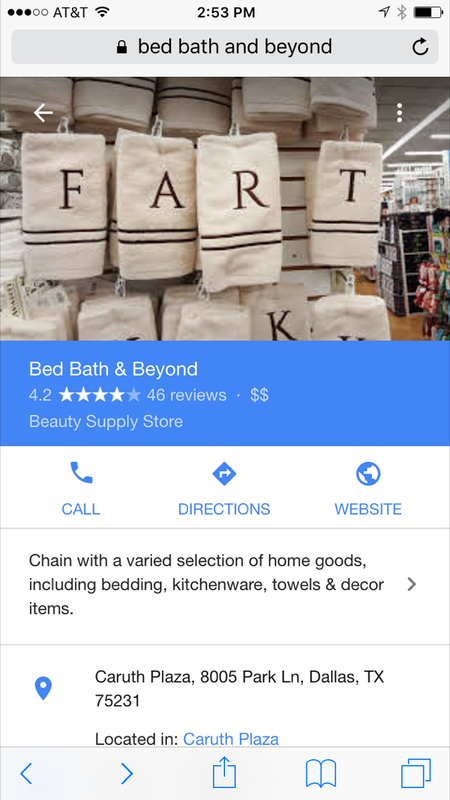 One example (which is kinda infamously funny) is when a miscreant at Bed, Bath and Beyond arranged one of their products to spell a “not-so-appropriate” word – then uploaded the image to the location’s Google My Business listing! No one wants that! Now that we’ve provided a little laugh, let’s dig into the best image sizes and best practices for a Google My Business listing. And video? Absolutely, don’t forget about video! GMB also allows videos of up to 30 seconds long and up to 100 MB, with a resolution of 720p or higher. Good to know…. If a business has a fantastic video, it could work to their advantage in a GMB post. GMB allows businesses to upload different types of photos, including a profile photo, a cover photo, and additional photos. The profile photo is a business’ main introduction. It helps customers easily recognize the business on Google. It shows up in Google Maps and search results. While everyone’s first thought might be to use a logo as a profile picture, real images tend to rank higher on Google than logos. The image should be relevant to the nature of the business, and it should also follow the optimization guidelines we talked about above. A cover photo is everything a business needs to show its distinctive personality and what else? Pizazz! The cover photo helps differentiate a business from its competitors. When a business adds a cover photo, it is automatically set as the preferredphoto. Even though the preferred photo won’t be guaranteed to be displayed as the first image for a business, it helps to tell Google that in fact, it isthe business’ preferred image. Exterior photos: Use at least three images to help customers recognize the business. Ideally, these should be taken from different angles and during different times of day. Interior photos: Ambiance and decor can make a huge impact for potential customers. A business should always try to showcase any particular interior features they’d like to be known for. Interior photos could also include common areas or guest rooms. Businesses can add up to three of each! Product photos: For businesses selling goods, at least three images of their most popular products should be included in their GMB listing. Work photos: If a business provides a service, the best way to convey it might be showing photos of their team hard at work. Three different images that showcase their most popular services are ideal, particularly images of any specialty services. Team photos: It’s important to show how proud a business owner is of their team. Businesses should make sure to include three photos of their management team and employees. A tip? Forget about poses and headshots, customers want to see the team in action. A photo of the business owner is always welcome as well. The image should not be copyrighted: The business should be the rightful owner of the image, or have the rights to use it commercially. The image cannot be a screenshot: Quality matters! Images should be high-quality, so definitely noscreenshots, or anything blurry, dark, rotated or overly edited. Say no to adult content: Suggestive images are a big no-no for Google. Even if the subjects are not showing much skin, Google frowns upon images that suggest a sexual encounter. Something else Google doesn’t like? Images that promote hate or incite violence. Claiming and optimizing a Google My Business listing takes a lot of effort. This includes the types of photos uploaded to a Google My Business listing. Fortunately, we’re here to help. Partner with Advice Local and let our local search experts do the heavy lifting. Request a demo today, and find out how we can help you and your clients. 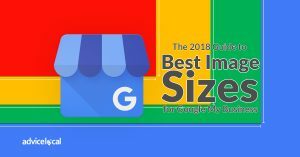 The post The 2018 Guide to Best Image Sizes for Google My Business appeared first on Advice Local.